Currently enrolled nursing students are able to take advantage of a variety of clinical experience and recruitment opportunities at Duke. Duke Nurse Recruiters often visit senior-level nursing student classrooms or participate in local career day events at many local universities and colleges. Additionally, informational open house events are held on the Duke University Hospital campus throughout the year and are great opportunities to learn more about specialty areas offered at Duke University Health System. Prior to graduation, nursing students are offered the opportunity to grow their skills and experiences by participating in our 10-week, paid PNA program. Duke Raleigh Hospital, Duke Regional Hospital, and Duke University Hospital participate in this program, bringing together students and preceptors in a unique, one-on-one clinical partnership. Mentor relationships strengthen the students’ awareness of nursing scope of practice and critical thinking skills. 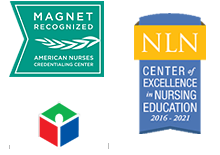 PNA program participants will apply for PNA positions that parallel the traditional scope of practice for Nursing Assistant (NA) roles, NAI and NAII as defined by the NC Nurse Aide Registry. Learning and nursing engagement occurs on a 36- to 40-hour/week rotating schedule in a variety of specialties, such as pediatrics, oncology, and adult critical care. To apply for this program, use the PNA requisition number listed in the job posting prior to the annual deadline of February 15 and obtain North Carolina NAI or NAII registry by May 15. All 10-week program dates will occur between May and August annually. Find answers to your student nurse questions on our FAQ page.